Posts about working with Unity3D. Make a game in a week? Sounds insane. Probably is. Read on to discover why I would attempt such a thing. 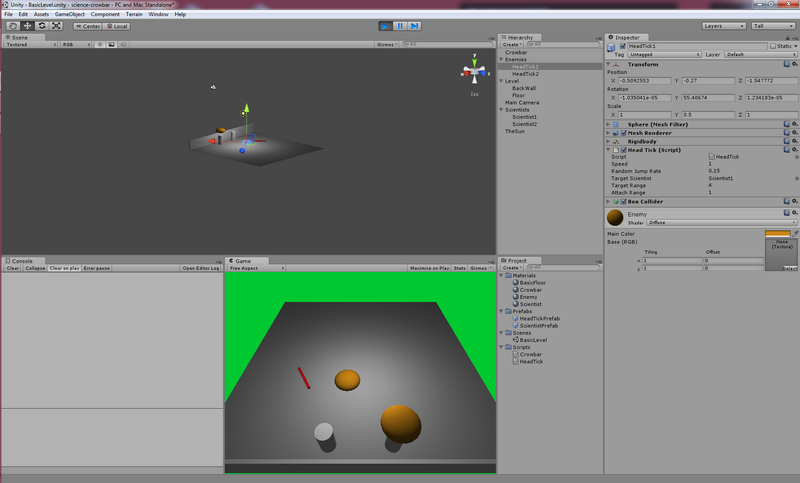 For my birthday this year I got myself something wonderful: Unity3D. I’ve just spent a week learning it, now I want to see what I can do! For the month leading up to my birthday I decided to have a go at doing things the hard way and ended up with a decent cooperative block-stacking game with some addictive, annoying audio. That’s a subject for another post. As development terrain goes, working with C++ and SDL was a bit like a jungle with some well-beaten paths – bring a machete and watch your step, but don’t worry too much about getting lost if you’re an experienced explorer. City folk had best bring a guide. One of my main reasons for hacking my way through the development jungle was to get an appreciation for how far we’ve come and what’s being done for me by more modern tools. I think it worked. Using Unity after doing everything by hand is like driving around a well-designed city. This is my first time visiting, and it’ll be a while before I can get around without a map, but everything is so well laid out that I’d have to be really trying hard to get lost. I’m also driving a hovercraft. Since game dev is officially a hobby at this stage, I went for video tutorials as a low-stress way of getting a handle on the basics. I dashed through the interface intro, then jumped into a 3DBuzz tutorial series. Overall it was a little slow for my taste, because it isn’t targeted at experienced devs, but interesting enough to breeze through over a week of after-work and a weekend hours. In the spirit of a recent 48h game dev comp attended by a friend over the weekend of my birthday, I’m going to see what I can throw together in a few short hours. I have an estimated 8 hours of dev time over the work week, and another 8-16 hours on the weekend, for a grand total of about 20 hours. For my simple game, I’ve picked one of my simplest game concepts: Science Crowbar. The player will control a crowbar, animated by the power of Science, and will be tasked with protecting scientists from invading Head Ticks that threaten to turn them into mindless zombies. Non-zombified scientists generate more science, allowing the crowbar to continue defending them. I suspect the current game club activity may have had an influence on this idea. In practical terms, I am aiming by the end of Sunday to create a single game screen (plus menu) without worrying about story progression. 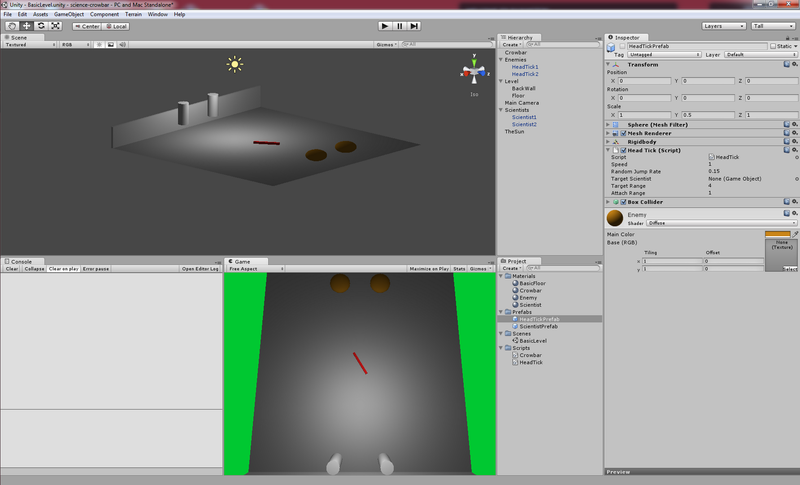 Levels will have random enemy spawns with a faster spawn rate as the level number increases. Surviving scientists will continue to the next level, and extra scientists will be rescued between levels (implicitly, for now). There is a lot more I’d like to do with the concept, but I’ve pared it down to the core gameplay and basic difficulty progression for this initial prototype. So, can I make a stable, simple game in a week with Unity? I’m about to find out.